Miss South Africa Rolene Strauss waves to the audience after being crowned Miss World 2014. She's flanked by the first runner-up, Miss Hungary Edina Kulcsar, left, and second runner-up, Miss United States Elizabeth Safrit, during the grand finale of the Miss World pageant in London on Sunday, December 14. Strauss reacts after being crowned. Miss World 2013 Megan Young crowns Strauss during the finale of the pageant. Strauss reacts to the announcement that she has won the title of Miss World. Strauss, Miss Kenya Idah Nguma and Miss Mexico Daniela Alvarez Reyes congratulate Miss Sweden Olivia Asplund on winning the swimwear fashion section of the pageant. Miss Brazil Julia Gama, center, reacts after being announced as a quarterfinalist. Contestants parade across the stage during the pageant. Miss Finland Krista Haapalainen, center, dances with a ribbon. Miss India Koyal Rana dances. Miss France Flora Coquerel waves to the audience. Miss United States Elizabeth Safrit performs. Miss Mongolia Battsetseg Turbat dances with other contestants on stage. Miss Scotland Ellie McKeating performs. Miss Slovenia Julija Bizjak dances. (CNN) -- Miss South Africa Rolene Strauss was crowned Miss World on Sunday in a competition in London. "South Africa, this is for you," she said in an interview after the pageant. "I'm so proud of you, and I'm proud to be your representative." Strauss, 22, inherited the crown from Miss World 2013, Megan Young of the Philippines. She won the title over runner-up Miss Hungary Edina Kulcsar. Miss United States Elizabeth Safrit took third place. Strauss, a fourth-year medical student at University of the Free State, put her studies on hold after being crowned Miss South Africa in March. In her official Miss World 2014 introduction video, she credits former South African President Nelson Mandela with paving the way for her to pursue a career in medicine by creating a democratic South Africa. Strauss said she looked forward to continuing the legacy of Miss World CEO Julia Morley, founder of "Beauty With a Purpose," a nonprofit that supports humanitarian projects of Miss World contestants. Those who participate in a charitable contest or cause through the organization compete for the "Beauty With a Purpose" award, winning points toward their final score. The focus on charitable acts helps counter criticism that the pageant promotes superficial images of women through swimsuit competitions and slinky evening gowns. As Miss South Africa, Strauss has promoted projects in women's rights, health and education, including one to provide menstruation education to schoolgirls in South Africa. 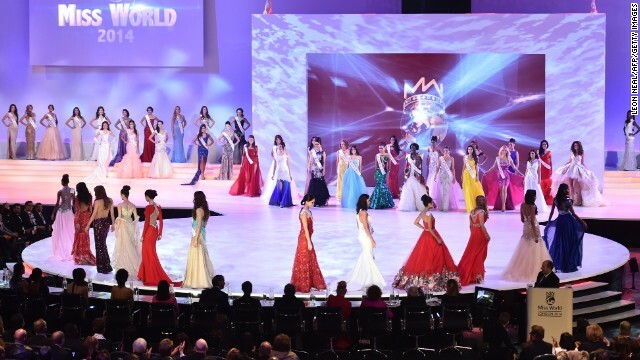 What do you think of beauty pageants such as Miss World? Tell us in the comments.